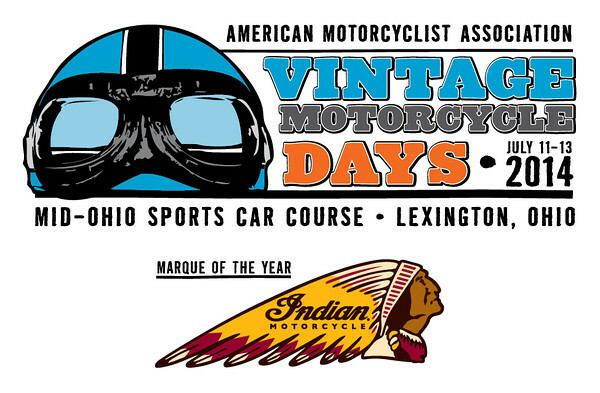 PICKERINGTON, Ohio — The American Motorcyclist Association is pleased to announce that Indian Motorcycle will be celebrated as the 2014 AMA Vintage Motorcycle Days Marque of the Year, July 11-13, at Mid-Ohio Sports Car Course in Lexington, Ohio. AMA Vintage Motorcycle Days featuring Indian Motorcycle as Marque of the Year will include special recognition, displays and race classes for historic Indian-brand motorcycles (including Indian “Motocycles” from the early days), as well as participation from the new Indian Motorcycle. Attendees to the three-day festival of vintage motorcycling will experience a special Indian Motocycle-themed tent on the Mid-Ohio infield featuring beautiful examples of classic Indian machines, as well as the latest machines from the new Indian Motorcycle. In addition, a full demo fleet of Indian Motorcycles will be at the event, allowing attendees to get a feel for the Indian Motorcycle line-up. “Few of motorcycling’s great brands have as much history as Indian Motorcycle, which began in 1901 and helped define the pre-WWII motorcycling era with iconic models like the Indian Scout and Chief,” said AMA President and CEO Rob Dingman. “With the modern revival of the Indian Motorcycle name being backed by Polaris Industries, we’re excited to celebrate the brand’s iconic motorcycling history, as well as its future.” Indian Motorcycle Vice President Steve Menneto says the company is looking forward to showcase its new models to some of motorcycling’s most die-hard enthusiasts. “It is a real honor to our entire team for Indian Motorcycle to be selected Marque of the year for AMA Vintage Motorcycle Days,” said Menneto. “We know that enthusiasts of all brands come to this event, and the chance to not only celebrate where the Indian Motorcycle came from but to display and ride where we are heading is going to make a for a fantastic weekend.” AMA members can purchase a weekend pass to AMA Vintage Motorcycle Days for $45, or a one-day pass for $25, saving $5 off the regular advance purchase rate. The AMA member discount is in addition to the regular $10 savings on advance ticket purchases, and there is no service charge for AMA members when purchasing through the AMA, making the savings even greater. AMA member pricing, available through May 27, is only available by calling the AMA directly at (800) 262-5646. Advance tickets are available to the general public at www.midohio.com, with all kids under 12 admitted free with a paying, supervising adult. A fundraiser for the AMA Motorcycle Hall of Fame, AMA Vintage Motorcycle Days features classic motorcycles of all makes and styles, and honors the riders who made them famous. Activities include the AMA Racing Vintage Grand Championships, which include amateur national championship road racing, motocross, hare scrambles, trials and dirt-track; North America’s largest motorcycle swap meet; bike shows and awards; stunt shows; demo rides of current production bikes; an AMA Life Member breakfast; and seminars on a number of topics by noted motorcycling experts. If you’re not an AMA member, we invite you join the nation’s largest grassroots organization that fights for your freedom to ride and race — visit www.AmericanMotorcyclist.com > Join the AMA. Visit our Midwest Calendar page here on R.A.G. for the details about this event. 57 queries. 37.75 mb Memory usage. 1.704 seconds.